With our shoe donations in a large holdall, we linked up with Amadou Tounkara from a very new organisation based in the capital of the North African country of Mauritania, Noukchott. Amadou is a representative of Aide aux Enfants de Mauritanie Help the Children of Mauritania which forms part of a larger parent organisation based in France that is called Aide aux Enfants du Monde Help the Children of the World. As so often in life we met with Amadou by chance and found out that he had worked with Aide aux Enfants du Monde and been involved in the transport and distribution of clothing, supplies, IT equipment in Mauritania and Senegal. Aide aux Enfants du Monde also works to set up water taps in areas where there are problems with basic water supply. Amadou also works in a hotel in Nouakchott and told us that he had grown up with one of the toughest areas in Nouakchott. We told Amadou about our holdall full of shoes and that we would like to distribute them to those in need and he said that we could do this through his organisation and that he would organise this to happen in the place where he grew up. 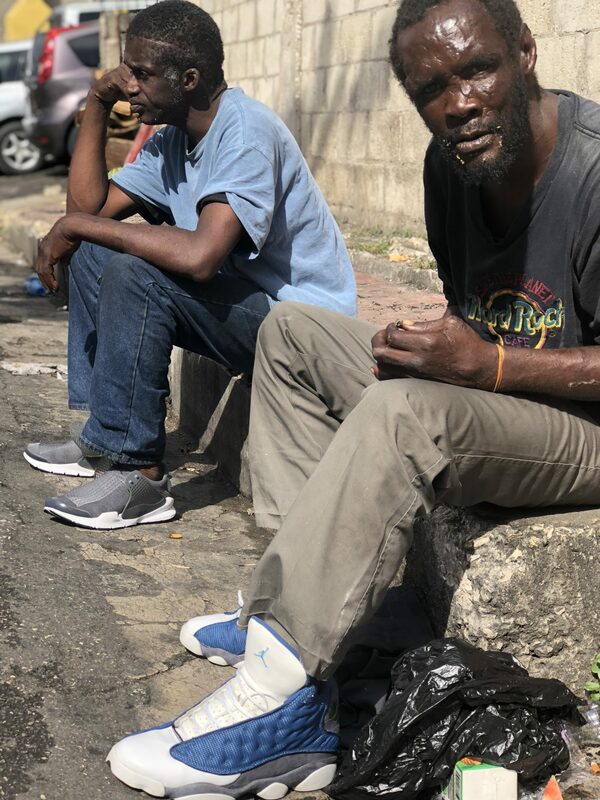 Amadou wanted to assure us that he was honest that the shoes would go to those that needed them but if we are honest he didn’t need to convince us. Amadou took us to where he lived and introduced us to his family and to a young woman who he called his cousin. He has rescued his ‘cousin’ from an abusive partner and took her in to live with him and his family. After this visit to his home we took a taxi to the Cinquieme, an area that Amadou described as one of the poorest areas in the city. There Amadou showed us the house that he and his family used to live in. A house with holes in the roof and within which when it rained water would come up almost to the knee. He pointed to the piece of foam that his mother used to sleep on an old computer and some old shoes. Amadou told me ” I have no shame about where I come from and about my struggle, I wanted to show you so that you understand where I am from”. He introduced us to the old man that mans the only water tap in the area. Slowly women and children from the local area and the local school began to arrive and we opened up the bag of shoes and started giving them away. As the kids took the shoes and put them on there was just this amazing pride on their faces that same excitement that we have when we rock a new pair of kicks. And there was something powerful too that a couple boys that love playing football would now have some decent boots and that some of the others would have some wellies to splash about with in the water. And maybe they’d be able to go to school the next day with their new shoes on and feel that feeling that is so easy for us to obtain. That pride. This piece is not written to bring about pity but written with the hope of showing the reality of the everyday for some people in Mauritania and a reality that is much harder than anything that we can even begin to imagine. And sometimes as difficult as they can be the stark realities of this world have to be seen in order to inspire people to work to improve those realities. The people that live in the Cinquieme in Nouakchott were amazing, happy people, despite everything. But people that are in many ways powerless to effect change. We have so much power and we can change the situation of others and share our power with them, so that they can be empowered. And for us that was what this shoe collection was about, about empowering others. We wanna big up all the people in the Cinquieme in Nouakchott, Amadou, Francois and all the crew from the Hotel Jeloua in Tevragh Zeina, and we want to BIG UP all those that donated shoes you guys are amazing too, we could not have done it without you. And we hope to work more with the two organisations in the future and that this was just the first step taken together.